Almost 51 years to the day of the concert, Elvis drove his own long, black limousine to the State Governor’s mansion in Nashville. The Memphis Mafia guarded his Rolls while Elvis was shown around by the daughter of the Governor. The tour could not have taken long because on his way home from Elvis stopped at the Tennessee State Prison and visited Johnny Bragg, the lead singer for the black vocal group, The Prisonaires. Nothing defines Elvis and his reach better than what he did that day and it explains why the great gospel singer Jake Hess once called Elvis, ‘The Great Communicator’. The communication skills are still in demand. The crowd in Manchester was boozy and enthusiastic. Afterwards, I drove back towards Liverpool thinking about the Elvis visit to the Governor and his subsequent meeting with Johnny Bragg. My two daughters talked about Elvis and Amy Winehouse and why certain talented people destroy themselves. We agreed that the tragedy of Elvis was double edged. Not only did Elvis self-destruct but the waste deceived people into thinking that the talent was insignificant. These people watch the odd clip on TV and assume that Elvis was a bit of a dope that got lucky. The Saturday show of Elvis In Concert is not perfect but then Elvis was always a mixture of the inspiring and irritating. Some of the songs are included because they are crowd pleasers, songs like The Wonder Of You, My Way and What Now My Love. These numbers deter many but when they are played live through a modern PA with Elvis supported by a band that was once considered the best that money could buy the listener soon suspends criticism. Elvis In Concert defines Elvis quite well. On oldies like I Got A Woman and Heartbreak Hotel he rocks with real force while his performances of How Great Thou Art and Bridge Over Troubled Water stand apart from anything delivered by other performers. In his 1971 review of a Boston concert, Jon Landau wrote that once you had seen Elvis sing Bridge Over Troubled Water you could die. He was right. Last night I saw Elvis sing Bridge and How Great Thou Art which is even better. I will not say anything to avoid tempting fate. Finally, we have the performances that show Elvis can be hip. Again the memory of Suspicious Minds’ alone would be sufficient to face death but it is complimented with fabulous versions of ‘Polk Salad Annie’ and ‘You’ve Lost That Loving Feeling’. No other singer has ever attempted or mastered so much. Elvis In Concert may flatter what Elvis often delivered on stage in the 70s but at his peak he was more than capable of delivering the show that so enthralled the quite young audience in Manchester. No wonder we stay loyal. My only criticism is the 50s melody in the first half which drags. This is taken from his Las Vegas shows. His black and white 50s performances or the hits medley from the TV Special would be better. 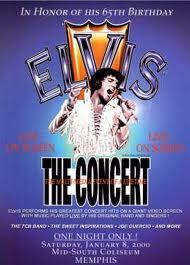 Elvis In Concert has never had a bad review so the technology that supports the show works. Elvis also plays his part. His talent and a personality that embraced visiting the State Governor and Johnny Bragg in the same day make him unique. To read about Elvis, rock and roll and much more, click here. Bob, I will watch the space for your Elvis stories.